Here's the thing - I only allow myself to drink alcohol two or three days per week and have been doing so for about the past three/four years. This means that Fridays and Saturdays are definitely reserved for enjoying a couple of cocktails, and depending on how I'm feeling I may have a drink on Thursday or Sunday, but never both. I do this for a number of reasons, but mostly because I just feel better not drinking! I exercise almost every morning and take my health pretty seriously, so I just feel like it's a no-brainer to cut back on alcohol. With that said, when I do have a cocktail I make sure it's a good one and not something that's a waste. One of those drinks that I save for the weekend is sangria. Full disclosure here: I am NOT a red wine drinker because I do not like the taste of it, the temperature at which it is served, how it stains your teeth... I can go on and on. But, I do love me some sangria. Sangria is fruity, a little sweet, refreshing, served chilled, AND I can drink it through a straw without looking like a crazy person with red teeth. Win-win-win all around. Alex and I started making our own sangria when we first started dating 4 years ago, and so it's kind of "our" drink and it's nice when we make it together. We have made smaller batches for ourselves for movie nights in, and we've made huge batches for Halloween parties or get togethers. No matter what time of year, it always hits the spot. When it comes to choosing which red wine, don't worry so much about it. You can go the traditional route and pick a nice Spanish wine like a Rioja, OR you can do as Alex and I do and get Trader Joe's very own "2 Buck-Chuck" aka Charles Shaw wine (we get Cabernet Sauvignon). There should be no shame in buying cheap wine for sangria because it's not the star of the show and is masked by brandy and triple sec. So with that said, please try out my favorite sangria recipe! Feel free to play around with the ingredients, like instead of using basic oranges you can try blood oranges or even ruby red grapefruit, and maybe pears instead of apples. Do whatever your sangria heart desires! P.S. Do not forget to eat the fruit - that's the best part. Seriously. In a large pitcher, mix together all ingredients except for the sparking water (wine, brandy, triple sec, orange juice, and fruit). If time allows it, let the sangria sit in the fridge overnight in order for natural fruit juices to be integrated. 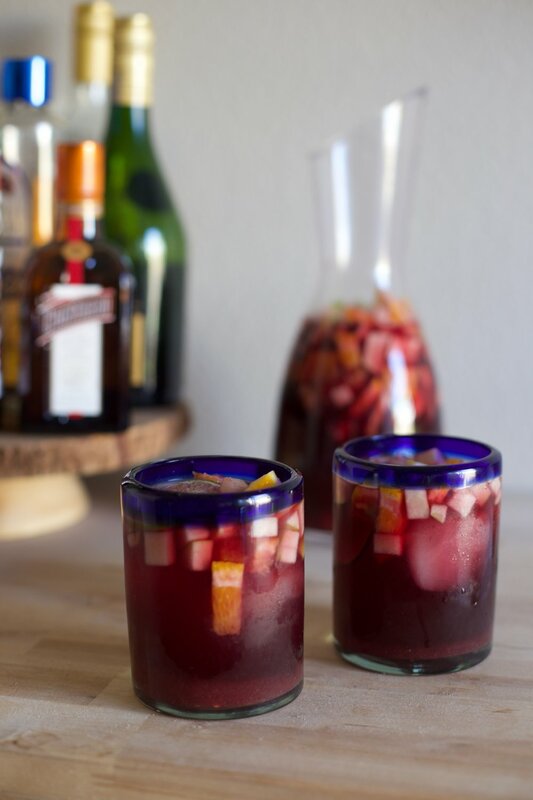 When ready to serve, pour sangria in glasses over ice and if desired, top off with sparkling water.